New Chitose Airport, near Sapporo, is the primary gateway to Japan’s northern island of Hokkaido… and it’s also home to a beautiful hot spring. Located in the domestic terminal building, the aptly named New Chitose Airport Onsen has a stately entrance that can be found on the fourth floor. You can check carry-on sized bags at the reception counter, and you also get a personal locker in which to store valuables. For maximum relaxation, you’re also loaned (free of charge!) a lightweight yukata or jinbei (informal summer clothes for men comprised of a light jacket and shorts), with several colors/patterns to choose from. If you’re feeling thirsty or hungry once you’re out of the tub and dried off, water and three types of green tea are offered free of charge. 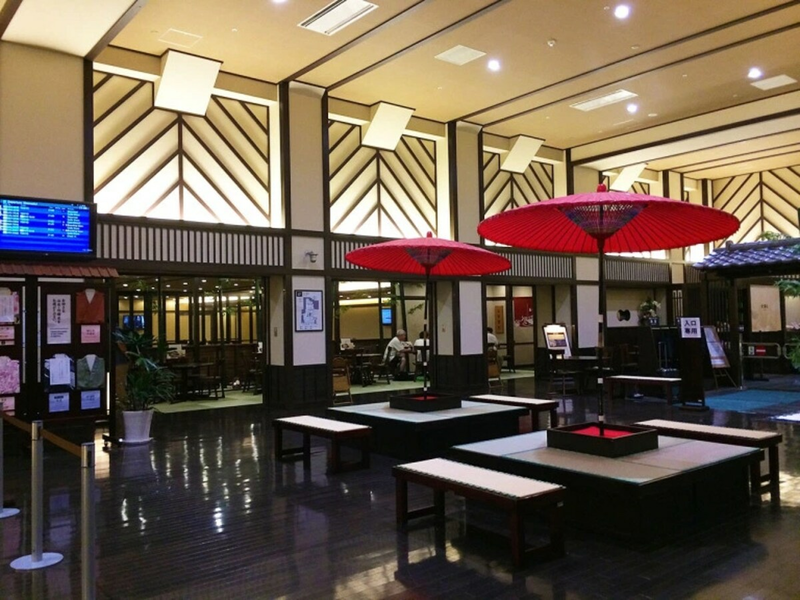 The onsen also has a casual restaurant serving noodles, rice balls, edamame and other snacks, as well as beer, sake, shochu and soft drinks for additional charges. Instead of paying directly at the restaurant, the staff scans the bar code on your locker key wristband when you make a purchase, and you settle the bill when leaving the onsen. Admission to the onsen is ¥1,500 (US$13) for adults, with kids costing ¥800 (for those in elementary school or older) or ¥600 (for ages 3 to 5). That price gives you use of the facility from 10 a.m. to 1 a.m., but should you arrive after 1 a.m., your entrance fee allows you to stay until 9 a.m. the next morning. This makes New Chitose Airport Onsen a great place to spend the night if you’re catching an early flight out to another part of Japan the next day, especially since the overnight pack includes a complimentary breakfast! …but for no additional cost beyond your standard admission, you can snag one of the reclining chairs in the quiet relaxation rooms, which are equipped with personal TV monitors and terry cloth blankets. There’s even a women-only room for ladies who don’t feel comfortable dozing off in an area accessible by male guests. After a long hot spring bath and a tasty meal, you shouldn't have any trouble falling asleep until the next morning, when the announcement over the P.A. system tells you that breakfast is ready. If you’re passing through Hokkaido on your Japanese journey, make sure you stop by New Chitose’s hot spring.